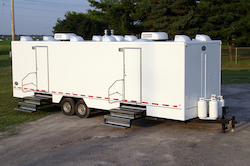 Our mobile shower trailers come in a variety of shapes and sizes and can be used for many applications including military training sites, disaster relief, camp and church outings, industrial outages, and music festivals in WV, OH, IN, KY, PA & MI. These eight-head portable showers pictured have two separate sides, one side for men and one side for women, each with four private shower stalls with private changing rooms, two sinks with electrical outlets and a large mirror. The portable shower units are equipped with heat and air conditioning and have on-demand hot water tanks for endless hot water. The shower trailers shown have on-board 300 gallon water tanks if no water source is available, water pumps and a 1,300 gallon waste water tank. Electrical connections needed are four standard 110v outlets on separate 20 amp circuits. 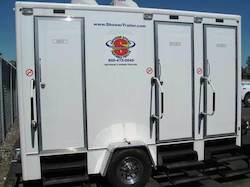 We will gladly rent these shower trailers for a one day event, weekly, monthly or yearly.